Update 10:24PM CST: Some corrections have been made about how this will be implemented. ADB Backup in TWRP will not be initiated by a GUI, but via an ADB command from your computer. The syntax of the commands will slightly differ from the AOSP ADB command, however. If you’ve come to the XDA forums looking to install mods, ROMs, or kernels onto your device, there’s a very high chance that your device has TWRP flashed onto it. TWRP has evolved from being an alternative to ClockworkMod recovery back in the HTC Evo 4G days to becoming the most widely used custom recovery in the Android community. Its feature-set has greatly expanded over the years, and it now supports virtually every device with an unlockable bootloader. The open source project led by TeamWin is always hard at work fixing bugs and porting the recovery to new devices, but work on new features continues behind the scenes. One feature that has actually existed for quite some time in the TWRP respository but which has never been shipped in an official build is ADB backup. That will soon be changing, however, as we have learned that version 3.1.0 of TWRP will finally ship with ADB backup support, thus allowing you to make full data/system application backups straight to your computer. ADB backup is a command line tool which allows you to make entire data and system backups, which is what most people seek when performing what’s known as a NANDROID backup. If you issue the right commands, you can create a backup of your applications and their data without needing root access or a custom recovery. If you are comfortable with the command line, then this shouldn’t be too difficult to understand. However, many users are not comfortable with ADB or the command line in general, and would prefer having a nice and easy way to take advantage of this functionality. That’s where TWRP’s new function will come in. TWRP will offer the ability to perform an ADB backup for you – all you have to do is select a few options and slide to confirm, something you are probably much more familiar with. Update: we have learned more details about this upcoming feature. While TWRP will support backing up via ADB, it will not be initiated from the TWRP GUI, but through your PC. However, the exact syntax used in this case will differ than the AOSP implementation. 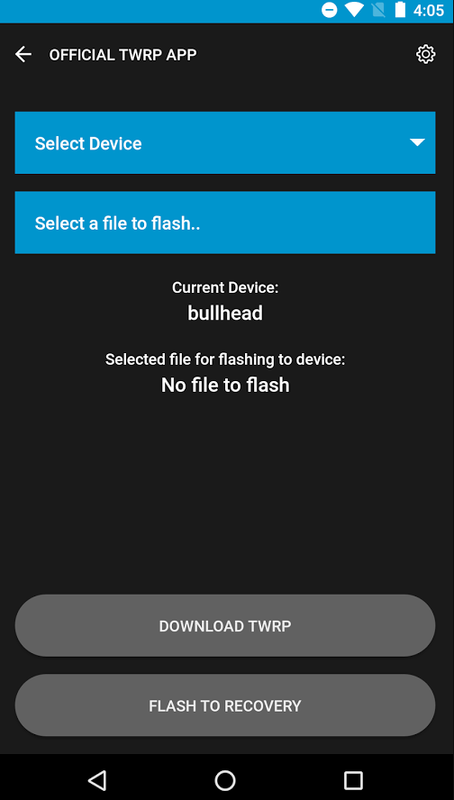 We suspect that doing this via TWRP will allow for any application to be backed up, even if that application is not normally able to be backed up via the standard ADB backup function. Doing an ADB backup means you can skip having to save several gigabyte-sized archive files onto your phone. This is especially useful for when you want to make regular backups but don’t have a lot of internal storage space left to sacrifice. Instead, you’ll be streaming backups straight to your PC over a wired ADB connection. An added benefit of this is that this will reduce wear and tear on your device’s internal storage, as you will forego writing potentially thousands of files into an archive located on your internal storage. Making regular backups of your data is essential if you are frequently flashing new mods, kernels, or ROMs onto your device. There’s no telling when something you flash or something you changed will cause an irreversible bootloop, leaving your only way back to your daily setup a backup made via TWRP. If you’ve been putting off making regular backups because of how much space they take up, then I highly recommend you take advantage of this new feature – when it comes out. Remember, the developers behind TWRP (and any freely available software on our forums) put a lot of work into these projects, but they still have regular lives and jobs they need to attend to. An update to TWRP will be done when it’s done; we don’t know when that will be and we can’t expect the developers to give us an exact timetable. Just be patient and, most importantly, don’t ask for an ETA. 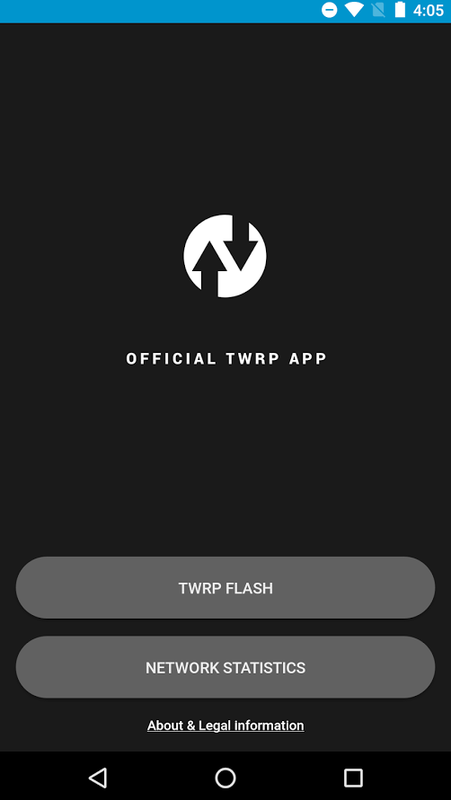 Back in the middle of December, we announced that the first official TWRP was finally available in the Google Play Store. Since its initial release, the application has seen a number of updates enhancing functionality. One of the major new features is the ability to backup existing boot and recovery partitions, in case you ever need to restore one of these for whatever reason. On the UX front, the application has undergone some simplifications to make it easier to tell when you are flashing an image and when flashing is successful. Finally, they’ve also changed the background colors so it doesn’t appear as jarring as it once did. Now, the UI somewhat resembles the actual TWRP recovery interface, which while fairly simplistic is very easy on the eyes. Check it out!